This is Gregory. He is an Art Librarian at a prominent museum. But he has a secret that he tries to hide from his colleagues. He is addicted to purchasing ARLIS/NA merchandise from the CafePress store. He says he can stop at any time and that the profits go to a good cause*, but he is kidding himself. He fantasizes about even more objects with an ARLIS/NA logo. Please help Gregory and others like him by purchasing ARLIS/NA merch so that he can stop. 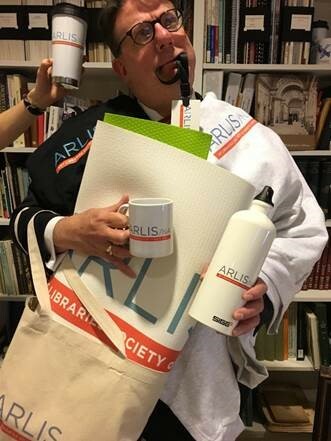 *Proceeds from the sale of ARLIS/NA merchandise sold through the ARLIS/NA Mid-Atlantic Chapter’s CafePress store will be used to support the third joint ARLIS/NA+VRA conference in Seattle and the Chapter’s Caroline Backlund Travel Award. Book artist Carol June Barton will talk about creating sculptural books, her research on historic movable books, and her background as a painter. See the Book Arts Lecture flyer for more details.